NASA unfurled the first of two golden solar wings on the new 17½-ton addition to the international space station early Thursday after overcoming a software problem that delayed the maneuver for hours. The solar panel, slowly opening like an accordion window blind, looked like a cosmic blanket of gold bars in the reflection of an orbital sunrise. The astronauts adjusted the space station's position so the panel would be heated by the sun to prevent it from sticking together, a problem astronauts have encountered before. NASA engineers ran into an early problem when they didn't get the response they wanted from commands to a ferris-wheel-like rotating joint that allows the solar arrays to move with the sun to maximize the amount of power generated. They were able to fix the software glitch, but it put the day's activities several hours behind schedule. Space shuttle Atlantis' 11-day schedule is tightly packed, and the arrays need to be deployed in order for astronauts to go on the third and final spacewalk of the mission Friday. The mission is the first since late 2002 to resume space station construction, which was halted after the Columbia accident in early 2003. "About the only thing on the timeline that's accurate at this point is probably the postsleep," astronaut Kevin Ford in Mission Control in Houston told space station astronaut Jeff Williams, referring to the time after the crew wakes up devoted to personal hygiene. "Nothing like adding a little drama to the day," Williams said a short time later. 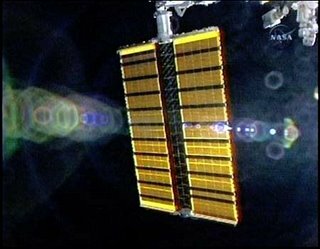 The solar arrays were mounted on blankets and folded up like an accordion for delivery to space as part of the new $372 million addition added to the space station. Together, they span 240 feet. When the space station is completed in 2010, the solar arrays will provide about a quarter of its power. Two of Atlantis' astronauts are experienced in deploying solar arrays. Atlantis commander Brent Jett and mission specialist Joe Tanner were members of a crew in 2000 that also delivered a pair of solar wings to the space station. During that mission, the solar panels unexpectedly stuck to each other while they were being deployed, but the problem was fixed. This time around, NASA devised a new method for unfurling the solar wings which allowed them to be heated up by the sun. Congratulations to the Atlantis crew for a job well done during this crucial ISS mission. The International Space Station is finally beginning to resemble the majestic vision of its planners.